Slim, All-Metal, Matte-Black Body with an Amazing Point of View. 7.2 Megapixels for stunning prints as large as 16 x 20 inches. 3x Optical Zoom-Nikkor Glass Lens provides exceptional images with incredible colour and clarity. Optical Vibration Reduction Image Stabilization minimizes the effect of camera shake. 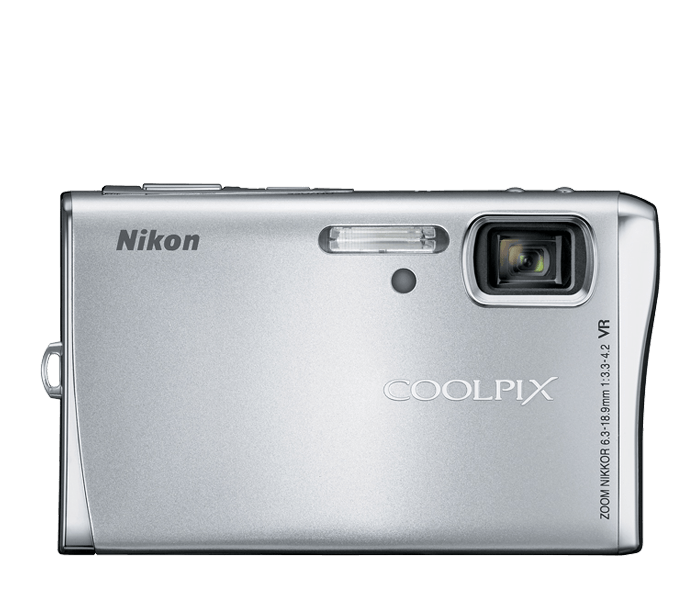 Huge, bright 3.0-inch high resolution LCD offers 170-degree-wide angle of view, making it easy to share your pictures. Auto adjusts up to ISO 1600 to keep shooting, even in lower light. One-Touch Portrait Button automatically activates In-Camera Red-Eye Fix and Face-Priority AF to create stunning portraits. All new Pictmotion creates in-camera slide shows with your music. Nikon In-Camera Innovations featuring: In-Camera Red-Eye Fix automatically fixes most instances of red-eye in the camera. You may never see red-eye again. Face-Priority AF - Nikon's face-finding technology that automatically focuses on faces, and D-Lighting that rescues dark or backlit images by improving brightness and detail where needed.